For the love of life: Hip Hop!!!!!! Happy Hip Hop!!!! 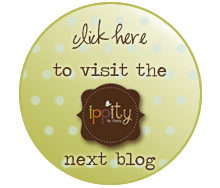 Hope you have had a nice hop so far and glad you have arrived on my little blog. Of course, if you didn't come here through the blog hop, you might want to start out with the Unity Blog, so you don't miss out on anything. Today our theme is December Daily - Journal your Christmas....but I am not planning on making one this year, so I got excused and since I didn't make a Gratitude Journal a few weeks ago, so that is the project I decided this time, as that is something I have been wanting to make, so today I am sharing my newest creation, which I will so enjoy putting my daily gratitude thoughts in. Hope you make one, too. So, I am in love with this My Minds Eye papers sooo much. In fact so much, that I bought two more sheets of it and I altered my journal with it to make it more of me. I used two of our Ippity stamps on this cover, the sentiment came from The Moment in time set and the frame stamp came from the Love in Return sets, interestingly both are scrapbooking sets. I also used Samantha Walker's Silhouette digital cuts, the labels for my frame set and the sentiment were cut by her designs and I used My Favorite Things Rolled flowers and their Crochet border, which literally just arrived in my mailbox... The whole book is Mod Podged together...it's very sturdy indeed, so I can use it without worrying about it falling apart. I added a sweet lace to tie my book each time after I add my gratitude. And remember SUNDAY is the day, when we will start having our sneak peeks of the newest IPPITY stamps...boy, I started working on them, and I am having sooo much fun with them!!!! I know you will love them, too. Have a fabulous day! 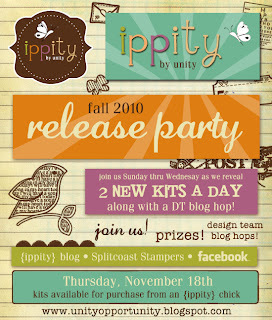 And don't forget to visit Unity's Forum at Splitcoaststampers, as we are going to be chatting it up!! !